Think monthly payments first and foremost. 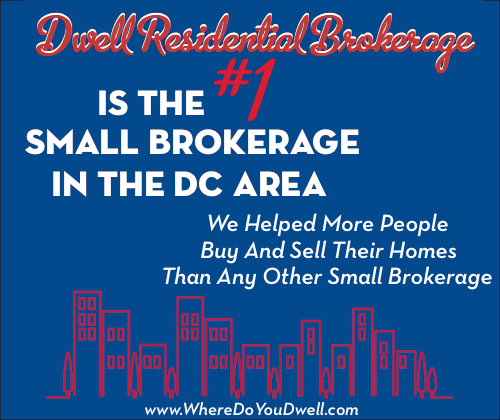 Here at Dwell Residential, we don’t want you to focus solely on the purchase price, but rather first start with your desired monthly payment for your home. This monthly payment should factor in your taxes and insurance (but not utilities and general monthly maintenance). We call this our Mortgage Rule of Thumb. It may seem backwards but it’s the one and only way to make sure you get the house you want for the price you want. Even if the purchase price is exactly the same, your monthly payment could be very different between two properties. For example, the monthly payments for a $500,000 condo will be completely different than for a $500,000 single-family home. There are different costs you’d need to consider for each option, such as condo fees. That’s why we tell our clients to NOT focus on the purchase price first since monthly payments can vary depending on where and what you buy. So never begin your search with a blanket statement, “I want to spend $500,000,” and not even know whether that amount will truly fit your monthly budget. Don’t just accept what lenders say you can afford. Unfortunately, many buyers start with that blanket statement of price because their lender pre-approved that amount for them. Don’t think you’ve hit the jackpot, since many lenders will approve a mortgage for you that could be way more than you are comfortable spending per month. We have clients all the time who say, “I’ve been approved for $500,000 by my lender,” but when we dig a little deeper, these clients actually want to spend a lot less in order to get the payments they truly want to commit to each month. Lenders will approve you for the highest purchase price possible based on several “big picture” financial factors, but it doesn’t really keep in mind what YOU want to pay per month on a home. Work backward to determine the “correct” purchase price for you. First, you need to figure out how much you want to pay per month, and then you’ll need to work backward to determine a purchase price that works with this monthly budget. Yes, it does seem backward at first, but we actually think the traditional way of doing things is the backward way! Once you know how much you want your monthly housing payments to be per month, you can then factor in your down payment and any homebuyer assistance programs. You’ll also need to include other potential costs of owning a home – taxes, insurance, condo fees – that will affect your monthly budget. With all these factors in mind, we can then help you figure out the correct price range to shop in. Keep in mind, every $10,000 in purchase price only adds an additional $50 to your monthly payment. Similarly, the same goes for your down payment: Every additional $10K you put down, you are only saving yourself about $50 per month. So don’t feel you have to save for years for additional down-payment funds in order to afford a home. And remember that there are some great options to help with your down payment. Take a look at your budget to determine what you want to pay per month. So now that you know to work backward, how do you determine what you want to spend per month when you own a home? It’s time to make a budget! Making a budget is an important step, so be honest about what you spend your money on each month now, what you’re willing to forgo, and what you expect in the future. Estimate yearly maintenance costs for a home. Plan to spend or save about 1% of your home’s purchase price each year. So, if you buy a $300,000 condo, you should be putting about $3,000 per year into the home for maintenance or into a savings account for when you need to replace something in the future! Consider additional expenses, beyond your mortgage payment and maintenance costs. Decorating costs such as new furniture purchases can add up in the early years of homeownership. What expenses are “mandatory” for your life and general happiness? Ask yourself some hard questions about your lifestyle now and for the future, and how that could impact your budget. For example, if you love to travel, then don’t buy a home that makes it impossible to go on a trip for years! That would not be worth it. What expenses could you tighten-up on to get the home you want? If you rarely drive your car and are willing to take mass transit or bike everywhere in your new home, then that’s where you could cut some of your monthly expenses. You could then possibly afford to buy a home in the location you want. Finish up the math to get an idea of how much you can afford. You can get a very rough estimate on what you can comfortably afford by using your current rental cost situation. Multiply your current rent by 1.33 to arrive at a mortgage payment that won’t bust your budget. This calculation takes into account the tax benefits of homeownership that can offset some of those additional homeownership costs. Don’t hesitate to contact us if you have any questions about calculating a monthly budget. It’s an important first step before you start looking at homes. Once you know your monthly budget, other steps will neatly follow. You’ll be able to determine your price range and then be able to work with your lender on available mortgage products along with any down-payment options. 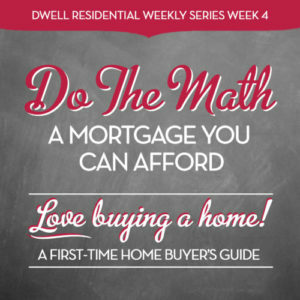 Next up in our Love Buying a Home Series is Where to Find Money for a Down Payment. Every buyer needs to be prepared for this and we can show you how!